This new image which was taken by the European Southern Observatory’s MPG/ESO 2.2-meter telescope at the La Silla Observatory in Chile, shows Lambda Centauri nebula, which is sometimes nicknamed the “Running Chicken” nebula, a cloud of gas and newborn stars that lies around 6,500 light-years away from us in the constellation of Centaurus. This nebula is also known as IC 2944. Hot newborn stars that formed from wispy clouds of hydrogen gas shine brightly within the nebula. According to astronomers the intense ultraviolet radiation from the young stars makes the surrounding cloud of hydrogen glow a dramatic red. 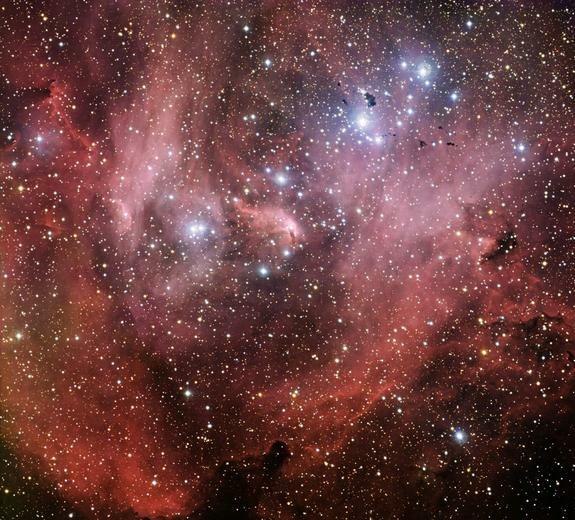 Astronomers at the European Southern Observatory (ESO), say that there is some disagreement over which part of the nebula is shaped like a chicken, since different birdlike features can sometimes be seen elsewhere. Also they find that these glowing nebulas live relatively short lives, typically lasting a few million years. This means that the Lambda Centauri nebula will eventually fade away as it runs low on its supply of gas and ultraviolet radiation.